Planning a firm-wide eBooks rollout? Get some tips here! 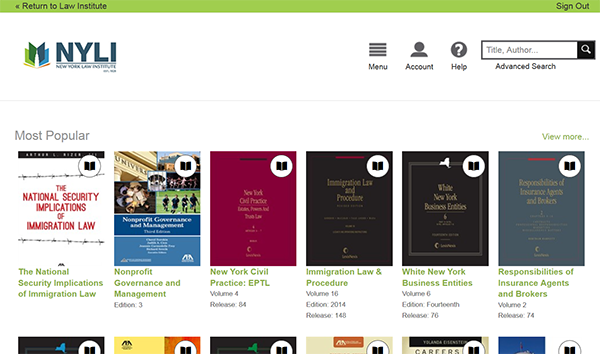 The New York Law Institute offers an EBL eBooks collection with over 160,000 eBooks available to members! This service, powered by the EBL/Proquest is currently free for all NYLI members, who may now download eBooks to their devices anytime, anywhere. There are no waiting lines for our eBooks as multiple readers can check out the same title at the same time. 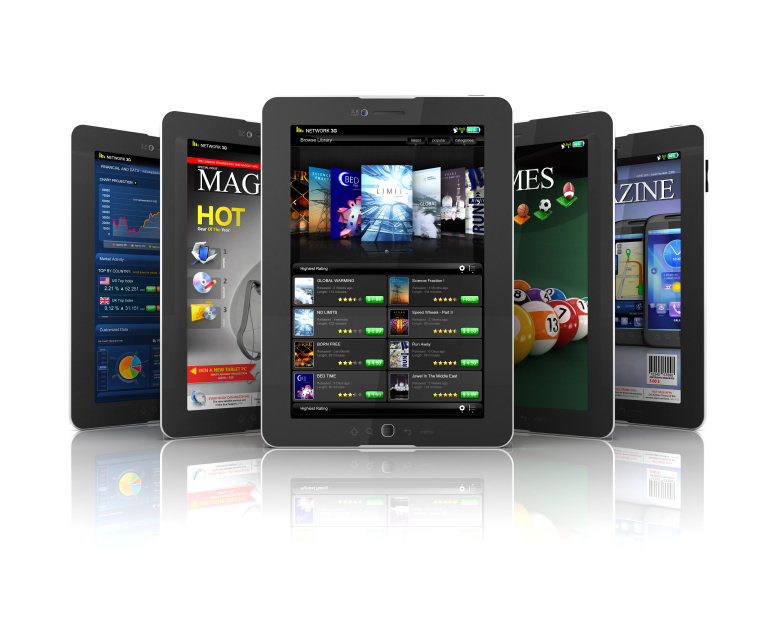 eBooks may be downloaded to members’ computers and a variety of devices and used immediately. They will automatically expire at the end of the loan period. Subject coverage includes legal, financial, business, economics, and more. Q.) 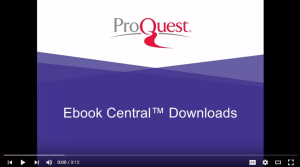 How do I send eBooks on to attorneys? A.) You may want to send an eBook recommendation to an attorney or colleague at your firm. In order to do this, follow the instructions below for linking to eBooks. Additionally we suggest that you send along the firm-wide username and password which has been supplied to you, rather than your individual login credentials. If you foresee that the attorney/colleague will be a regular eBook reader, you may also contact us and we will set up an individual login for them. 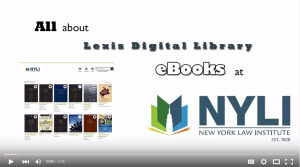 The easiest way to send links to eBook records to others is to click into the eBook from our NYLI OPAC or All Collections Search. If you are browsing the EBL portal, you will simply click into the eBook record. On the left side, underneath the cover art for the book, click on the “Share Link to Book” link. copy and paste that link into an email with your firm-wide login details. Q.) How do I send lists of eBooks to attorneys? A. ) On the Details page of each eBook record in EBL, there is an “Add to Bookshelf” option which will let you set up lists, or collections of eBook records. Once you’ve created a Bookshelf, you can access it by clicking “Bookshelf” at the top right of the EBL interface. There will be an “Email Folder” option as well as a “Share Link to Folder” option at the top right within each of your Bookshelves. Q.) Can I read the eBooks without having to download Adobe Digital Editions (ADE)? A.) Yes, you can read the eBooks within your browser without downloading them to ADE, but you won’t have access to them for offline reading. Q.) Why am I not getting to the login page for the eBooks? A.) This is most likely a firewall issue. Be sure that your IT Department has HTTP: 80 and SSL Port: 9443 open as that is what OCLC’s EZProxy uses to sign in users. For further instructions, please contact our Director of Information Technology, Ellyssa Valenti. Q.) What do I do if I can download eBooks to my computer but not my iPads and other devices? A.) If your connection is timing out when trying to download an eBook to your iPad or other device, but it’s working on your computer it may be that your wireless network does not have port HTTP: 80 and SSL Port: 9443 open as that is what OCLC’s EZProxy uses to sign in users. Be sure that port HTTP: 80 and SSL Port: 9443 has been opened by your IT Department not only for your regular network, but for your wireless one as well since that’s the port that our EZProxy uses. For further instructions, please contact our Director of Information Technology, Ellyssa Valenti. Q.) How much can I copy and paste and how much can I print? And does that renew when I check the book out again? A.) You can copy and paste 5% of each eBook and print out 20%. EBL keeps track of how much you’ve used based on your login ID, it will not renew if you check the book out additional times because those are the copyright agreements that EBL has made with the publishers based on a per user allotment. Q.) Why are my bookmarks and annotations not transferring to my devices? A.) Unfortunately this is a limitation of Adobe Digital Editions (ADE) – it cannot save or store bookmarks or annotations. Additionally the Bluefire Reader app is merely a way to use ADE on your devices and therefore cannot save them either. However! If you read the ebooks in your browser through the EBL interface, all of your notes and bookmarks, etc. will be saved here, even if your loan expires and you check out the book again. Q.) Is there a limit to how many eBooks I can borrow? A.) No, we haven’t placed any limitations on how many eBooks can be borrowed by each user at this point. This service, powered by OverDrive, is currently free for all NYLI members, who may now download eBooks to their devices anytime, anywhere. A.) Yes, you can choose to read the eBooks within your browser without downloading them to ADE, simply choose the green “Read (in your browser)” option. Q.) Why won’t Overdrive keep me logged in on my tablet? A.) Be sure you have cookies enabled. If you are on a firm-owned device you will want to contact your IT department as they may have disabled cookies as a part of their mobile device management policy. Q.) How much can I copy and paste and how much can I print? A.) Right now Lexis does not have any limitations on printing and copying and pasting. Q.) Is there a limit to how many OverDrive eBooks I can borrow? A.) Yes. Since these eBooks are limited to one reader at a time we have placed a 5 book limit on how many eBooks any user can check out at one time.